So what is this fårikål thing? In September Norwegian sheep leave the rich summer pastures in the mountains. Within a couple of weeks the scent of fårikål tells us autumn is here. Often described as a national dish, fårikål is a newcomer to the Norwegian kitchen. The first reference we have found dates back to the second half of the 19th century, but it was well into the 20th century fårikål became a household name. One obvious reason is that garden cabbage was a rarity in large parts of the country prior to the first world war. The parts of the lamb used for fårikål are neck, shank or breast, together with the bones. The parts sold as fårikålkjøtt in Norwegian stores generally looks as if the poor creature died at the hands of an axe-wielding lunatic . Some may be tempted to use other and presumably better parts of the lamb, but don't. The fat and bones of the parts used for fårikål are key to the taste of this dish. Welcome to our kitchen in Skorgedalen. 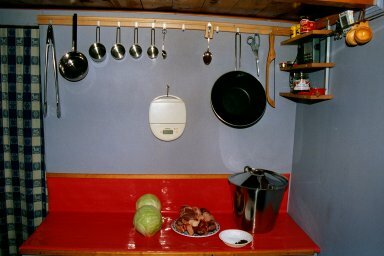 The fårikål ingredients are simply garden cabbage, lamb, salt, peppercorns, and boiling water. Cut the cabbage into segments as shown. 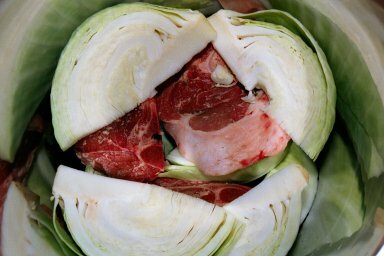 Place the lamb and cabbage in layers in the bucket - sorry pan, starting with the lamb. Sprinkle salt and peppercorns between the layers. Top layer should always be cabbage.
. ...and simmer over low heat for about 2 hours. 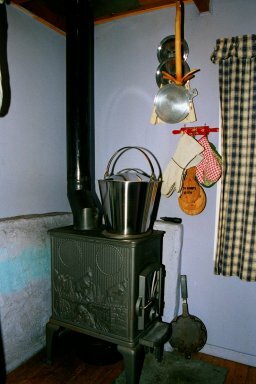 Like on our firewood stove in the opposite corner of the kitchen. Our cabin has no running water nor electricity, but to balance the romantic impression conveyed by this picture we should add that just to the left stands a modern gas kitchen stove with an excellent oven, a built in gas grill and even a rotating spit powered by our solar cell system. Fårikål is served with potatoes and gravy from the bucket. 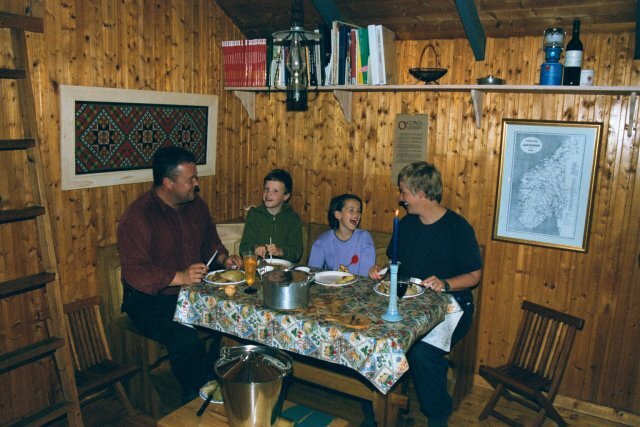 It is often said that fårikål should be served from very hot plates, but quite frankly it never tastes better than served on disposable plates at the cabin (se picture below). Glenn prefers beer and a good strong aquavite like Gammel Opplandsk with fårikål, while Eva prefers red wine. ¹ Bucket of Bah. Our daughter Yvonne is so fond of a fluffy little sheep she got when she was three. She is convinced the name får-i-kål (meaning lamb-in-cabbage) would be most distressing to her little friend. So we tip-toe around the subject calling the dish a Bucket of Bah. Bucket? At our cabin we cook fårikål in a two and half gallon stainless steel bucket.